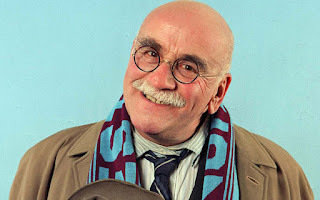 The actor Warren Mitchell who died yesterday aged 89 was best known for playing the working-class racist Alf Garnett in the 1970's TV comedy Till Death Us Do Part. Unlike out-and-out racist comedies of the 1970's like Love Thy Neighbour and Mind Your Language, it was Warren Mitchell and scriptwriter Johnny Speight's intention that viewers should laugh at, rather than with, the character they had created, but it didn't work out like that and Garnett became a hero to the bigots who took up his lines as their own. In an interview, Mitchell recounted how he, unlike West Ham-supporting Alf, a Spurs fan from an East London Jewish background, had once been embarrassed at a football match to become the subject of supportive chanting by racists on the terraces. Garnett's views are challenged in the show, by his long-suffering wife and his left-wing "Scouse git" son-in-law (played by Labour-supporting actor Tony Booth), but they both tend to come off second best to him. A much better attempt to challenge racism by way of comedy in the 1970's was Rising Damp in which the reactionary views of boarding house landlord Rigsby are made to look ridiculous by a black and a white lodger, played by Don Warrington and Richard Beckinsale respectively, and the audience does end up laughing at his backward attitudes rather than having their prejudices reinforced. Surely the message of "Love thy Neighbour" was to undermine racial prejudice by pointing out that black and white families faced the same issues. And from memory the laugh was usually on the white character played by Jack Smethurst.